The other day I read one of those articles about doofuses on Twitter, you know, the ones that insist on tweeting their ignorance of stuff generally considered common knowledge, like the folks stunned and amazed to discover that the Titanic sinking isn’t just something that happened in a movie. I was thinking about that while watching Abraham Lincoln: Vampire Hunter the other night, and began to anticipate the opposite kind of tweet, the one posted by the guy who watches the movie and convinces himself that he slept through the most fascinating history lesson ever: “Abraham Lincoln freed the slaves and killed vampires? For realz? #mindblown” That tweet, at least, would be mildly entertaining as opposed to the movie, which takes itself far too seriously to be very much fun. The movie has a joke of a title and, in its 3D presentation, throws stuff up at the screen with the wild abandon of Drive Angry or A Very Harold & Kumar 3D Christmas. Cheesiness is built into its DNA, but director Timur Bekmambetov squelches humor that might have breathed some life into the film in favor of dull earnestness. What this movie is crying out for is Evil Dead‘s lamebrain hero Ash and an actor with Bruce Campbell’s deadpan grasp of the absurd. Instead, it is stuck with a sober, familiar Abe Lincoln (albeit one with martial arts training and quite a way with a silver-tipped axe) and a bland Benjamin Walker, who looks the part but barely registers on screen next to more charismatic costars Dominic Cooper, Rufus Sewell and Anthony Mackie. Seth Grahame-Smith (who also penned the screenplay of the recent, even more dire Dark Shadows) adapts his own novel in which he offers an alternative history, one in which the 16th president of the United States is cast as a lifelong vampire foe and the Civil War presented as less a War Between the States than a battle between the living and the undead. Slaves are food for the vampires and that supply must be maintained. 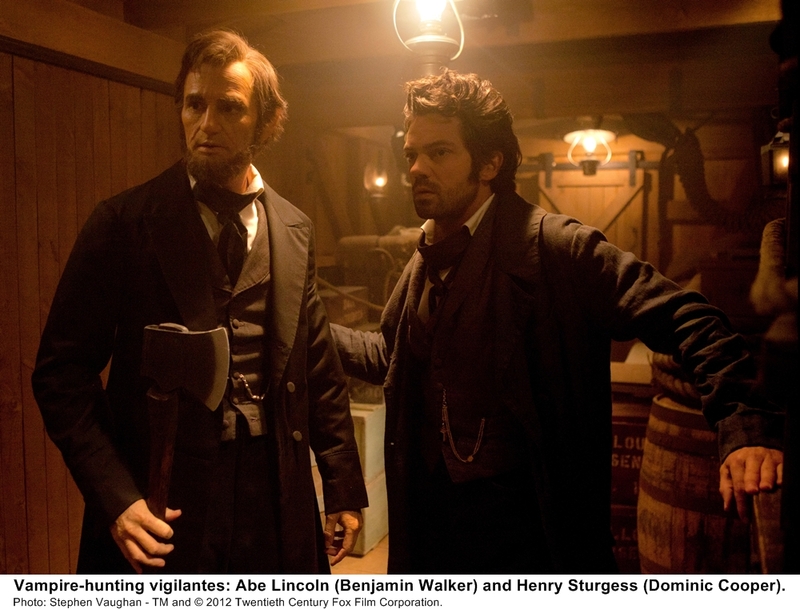 It is a conflict that pits Lincoln, vampire-turned-vampire-hunter Henry Sturgess (Cooper, playing the most intriguing character in the story, someone intent on wiping out his own kind), Lincoln’s childhood friend Will Johnson (Mackie), shopkeeper Joshua Speed (Jimmi Simpson) and Lincoln’s wife Mary Todd Lincoln (a pallid Mary Elizabeth Winstead) against diabolical vampire Adam (an exuberant, scenery-chewing Sewell) and his bloodsucking tribe. It is Adam who ups the ante in the Civil War when he offers Confederate President Jefferson Davis (John Rothman) a vampire army to battle the Union forces. Frankly, it is hard to top the horror of the actual Civil War. The addition of battalions of the undead in a fictional version of those historical events doesn’t top the terror quotient of the single bloodiest chapter in American history. But then Bekmambetov has as little sense of horror as he does a sense of humor. The whole endeavor is merely an excuse for outsized violence; adequate, if unspectacular, special effects; and one big rote action sequence after another. And it all feels a little derivative. It’s missing “the loom of destiny,” but at times, Abraham Lincoln: Vampire Hunter feels like a 19th century version of the director’s 2008 thriller Wanted in its lavish, loud and sometimes cartoonish battles. The two films even share similar climaxes. Apparently Bekmambetov enjoys playing with trains.